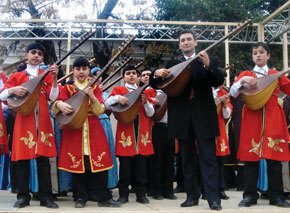 A rare type of concert was held in the centre of Baku in mid-November – of ashiq music. 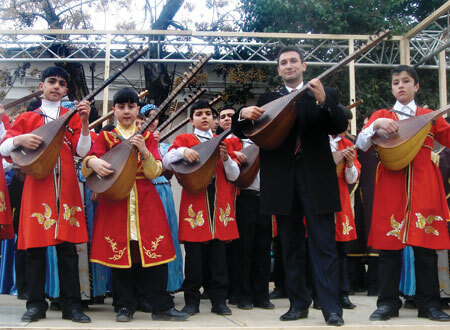 Although this is one of the most popular forms of Azerbaijani folk music, it is traditionally stronger in the mountainous and western areas of the country – mugham and meykhana are favoured in the east – and live ashiq (English pronunciation ashug) performances have not been so common on the Caspian side. A chance to see a whole range of performers was too good to miss. Was it worth it? The basic ashiq performance consists of singer and saz – the saz being a long-necked lute, traditionally strummed in accompaniment but now also played as a solo instrument. There are definite regional forms of performance and some of the singers at the Heydar Aliyev Palace were accompanied by the haunting woodwind pipe, the balaban, and percussion. 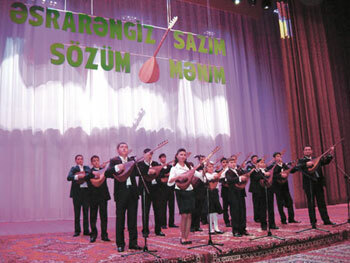 In some ways the venue seemed an incongruous setting for this music, which has a long, long, history, tracing its roots back to at least the 7th century Turkic epic Dada Qorqud (also written Dede Gorgud or Dede Korkut) – the eponymous storyteller playing the qopuz, a smaller ancestor of the saz. The nearest western equivalent would be medieval minstrels or troubadours: Robin Hood’s Alan A’Dale or Richard I’s Blondel. The image is one of wandering through villages and entertaining at weddings and parties, telling tales of old, laced with eternal truths and appreciations of beauty – altogether more village hall than concert auditorium. Many of the audience had clearly travelled in to the capital for the occasion and their traditional dress, topped (for men) by the high, cylindrical papag hat, contrasted with the plush formality of the Palace. In truth the extended succession of musicians playing the same genre also made demands on our powers of concentration; the variations in format, the occasional woman singer and even a jig from an amply-built male singer, were welcome diversions. The direction changed, however, with the arrival of Ashiq Adalet Deligagli, whose saz was more assertive and improvisational in performance, soloing to good effect. Despite that long, long history the saz only came to the fore as a solo instrument within the last 50 years – as in the west, claims have been made here of a great musical leap forward in the 1960s, associated with political movements for greater freedom. Whether true or not, we were soon treated to what must surely be the hope of the future. Sixteen young saz-bearing aspirants took to the stage and produced a cascade of tumbling harmony as they played under the guidance of their teacher, Nemet Qasimli. They may not have acquired yet the experience and authority required to pass on the knowledge and the wisdom of the ages, but their enthusiastic and united embrace of the challenge was thoroughly refreshing. As the youth departed stage right, their not-so-old (37) teacher moved centre stage to demonstrate just what can be done with this eight-stringed, long-necked, deepbodied, mulberry wood instrument. He was standing under a banner proclaiming, “.srar.ngiz saz.m, sozum m.nim” (‘My Wondrous Saz, My Word’). He did not use his voice, but Nemet Qasimli’s playing produced sounds as wondrous and eloquent as any bard as they soared, swooped and swirled around the theme of Sirvan Goz.ll.m.si (To the Beauty of Shirvan -a region of Azerbaijan). This is one of over 150 traditional havalar (literally ‘airs’) that the ashiq has in his repertoire. This performance took things to an altogether different level and it was clear that its energy was based on improvisation – always the most exciting element of live music. We had to find out more about the man and his music. It took some time to find a gap in Nemet’s schedule and we eventually caught up with him at a tribute concert for poet Veli Ahmed. The concert took place in the rather more suitably traditional setting of Baku’s Mugham Club, based in an old caravanserai – our interview was in one of the former guest rooms, now full of the carpets and textiles that are the staple trade in the medieval, walled inner city. 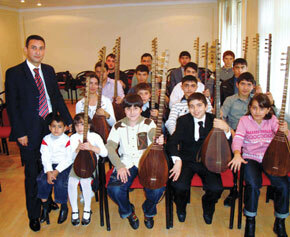 Nemet Qasimli was born in Gadabey, in the far west of Azerbaijan, into a family immersed in ashiq tradition. His mother, a gynaecologist by profession, was a fine singer and his father made sure that the home always had a plentiful supply of instruments for weekend family picnics at which all the family contributed to the musical entertainment. Memories of those days are so poignant that Nemet says he is transported back to that “other world” whenever he plays and sings – the emotion is such that he does both only when the occasion really demands it. He was as demanding of others as of himself; telling the story of getting his own first instrument when he was 10 or 11 years old. He says there were eight saz in the house but he thought they were inferior to those of the ashiqs who visited and he asked his father for a better one. His father brought three more from the nearest city, Ganja, but they did not come up to scratch either. By the time he was in 10th grade at school he knew 68 of the 72 melodies he was aware of. He then took a year off learning to consolidate his existing knowledge. He toured all the ashiqs he could find to pick their brains and skills. Some were defensive – after all, today’s novice might be tomorrow’s rival – so he would record their conversations or persuade friends to ask questions for him. (There is another part of the ashiq tradition – deyishme – in which singers compete in spontaneously improvising lyrics to a given rhythm). Nemet left Gadabey for the capital and higher education. A short spell at the Foreign Languages University taught him that he had to stay with music. The Culture and Art University provided a course in theatre music direction, and he even worked as an actor for two years. 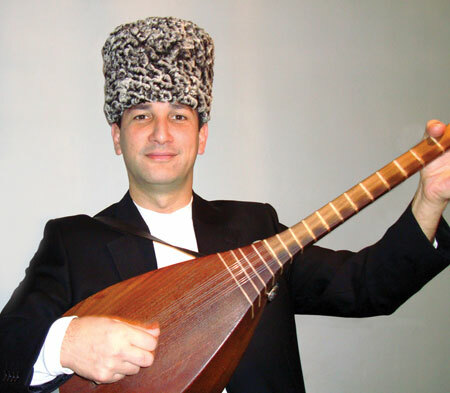 His heart was with the saz, however, and in 1992, at 20 years old, he was badgering the Qara Qarayev music school to let him teach the instrument to the youth of Baku. A slightly bizarre audition performance followed, in which he played lambada tunes before launching into ashiq to show what he and the instrument could do – the saz not being so familiar in the city. This was enough to get the go ahead and 32 children enrolled. Since then more than 400 have undergone the rigorous Qasimli method, earning honours for themselves and three diplomas for Nemet himself, for his contribution to their prize-winning performances. In our interview he was as keen to tell us about his students as he was to talk about his own relationship with this art of the ages, which places equally high value on both independence and “passing it on”. At 23 he joined the Science Academy’s Institute of Folklore to pursue research and he has contributed to recent government initiatives to achieve recognition of ashiq music by the United Nations cultural organization, UNESCO. He appeared with his students in a film presentation to UNESCO and they played before the organization’s director general, Koichiro Matsuura, when he joined last year’s celebrations of the spring holiday, Novruz Bayram. He also played at concerts in the Louvre (Paris) and Strasbourg. 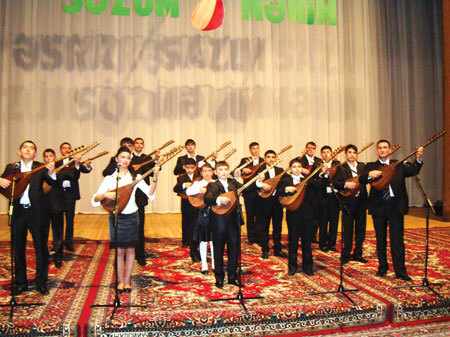 Azerbaijan’s submission to add the “Art of Azerbaijani Ashiqs” to UNESCO’s list of Intangible Cultural Heritage included the name of Nemet Qasimli among those “brilliant musicians” whose playing of the saz has “formed an independent field of ashiq performance”. The submission was accepted in early October and ashiq is now officially recognized as part of the world’s cultural inheritance. If you are outside Azerbaijan and want to sample the sound of ashiq (ashug) saz, there are one or two tracks on the internet (spellings vary, try Neymat Qasimli). There is as yet no studio album…. ….so you will have to come to Baku to see his fingers fly and hear the effect, or catch this free spirit on his next invitation abroad – don’t pass up an opportunity.